This handpiece easily converts your 401 Power Clipper into a cast cutter. The handpiece attaches quickly to any Double K cable driven clipper by using the quick detach feature to remove the clipper handpiece from the cable and simply snapping the 504-CC to the cable. Designed for use on plaster and fiberglass casts, the special, 2” Dicronite Blade resists cutting skin. It should be noted that the cost of the clipper and hand piece combined is less than the least expensive cast cutter on the market. The handpiece is autoclaveable for use in sterile procedures (the cable should be draped). The 504-CC will also double as an orthopedic and drilling tool for use in orthopedic surgical procedures and will accept drill bits and pins up to 5/32”. The handpiece neck opens easily using a convenient chuck key (included). 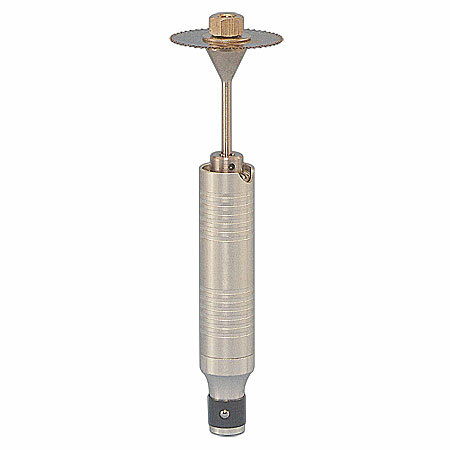 This handpiece can also be converted to a Nail Grinder using #560 Nail Grinding Stone attachment, a Hoof Polisher using sanding wheel(s) #584-A(fine), 584-B (medium), or 584-C (coarse) or a leather/silver polisher using cotton polishing wheel #585. Handpiece dimensions (without attachments): 5-3/16” long, 1” diameter, weight 5.85 oz.